A distraught Paula Radcliffe saw her dream of Olympic gold shattered after pulling out of the women's marathon at the 23-mile mark in Athens. The British world record holder and pre-race favourite had slipped to fourth and was clearly in distress in the blazing heat and humid conditions. The 30-year-old was later taken by ambulance for a precautionary check-up. Japan's Mizuki Noguchi won gold with Kenyan Catherine Ndereba taking silver and America's Deena Kastor the bronze. After breaking down at the side of the road, Radcliffe was accompanied by her husband and coach Gary Lough and her parents for the medical at the Panathinaiko Stadium, scene of the marathon finish. It is thought the two-times London Marathon winner was tired and exhausted rather than seriously injured in any way. Radcliffe, who described herself as "devastated" upon leaving after her check-up, added she would talk about her ordeal on Monday. Starting from the village that gave the event its name, Radcliffe was with the leading group for the first 15 miles but she never seemed comfortable in the blazing 35 degrees heat and high humidity. Noguchi pulled away at the 16-mile stage but Radcliffe was unable to respond as a series of steep slopes brought further agony for the labouring pre-race favourite. Radcliffe, who also just missed out on the medals in the 10,000m in Sydney, launched a brave bid to recover the ground and at one stage fought her way into the silver medal position. But she could not maintain her challenge and Ndereba and Ethiopian Elfenesh Alemu both raced past, leaving her in fourth place and out of the medals. 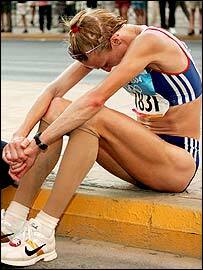 After pulling up once before finally stopping just three miles from the finish, the Briton sat slumped on the side of the road with her head in her hands as her dream of Olympic gold lay in tatters. Ngouchi maintained her form to hold off Ndereba by just 11 seconds and become the new champion in a time of two hours 26 minutes and 20 seconds. But Alemu also fell victim to the humidity as Kastor surged past to clinch an unexpected third place in 2:27:20. Two hours earlier, it had all looked so promising for Radcliffe and the vast army of British supporters which was packing the course and the finish in the old Olympic stadium. But instead of celebrating gold, Radcliffe's fans looked on in disbelief as their heroine's Athens hopes were ended. Britain's other two runners, Liz Yelling and Tracey Morris, managed to finish in 25th and 29th respectively, Yelling recording a time of 2:40:13 and 36-year-old Morris 2:41:00. Yelling was "absolutely gutted" to learn that her team-mate had failed to finish. She said: "I know how hard she has trained and how much dedication and sacrifice she has made. She wanted this one so badly. Maybe she underestimated the course." Will the golden glow soon fade?